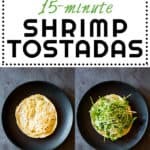 15-Minute Shrimp Tostadas, the perfect dinner for busy workdays! 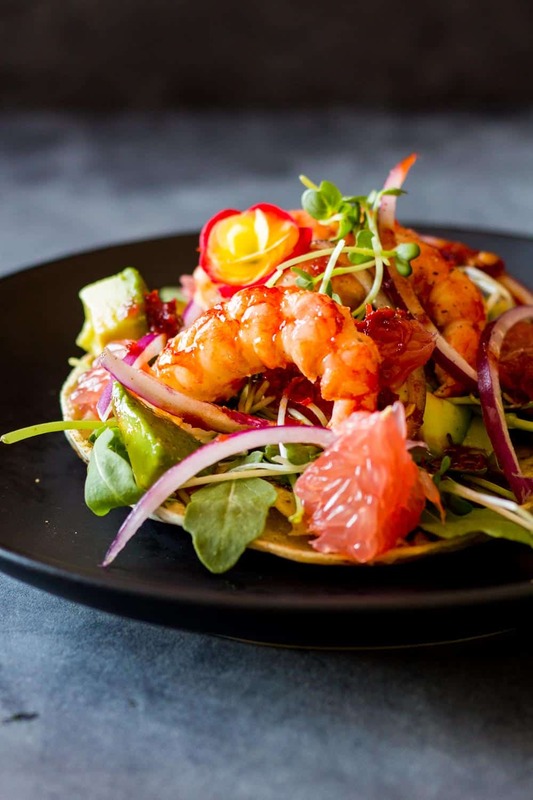 Crunchy tostada, fresh arugula, creamy avocado, juicy grapefruit, delicious shrimps and sweet-and-sour red chilli sauce. WOAH! I love shrimps for many reasons but the two main ones are, they are absolutely delicious and it takes 5 minutes (if at all) to cook them. On top of tostadas and together with all textures, colors and flavors your mouth knows you can prepare for a sensory experience that feels like butterflies giving you kisses from the inside of your belly. 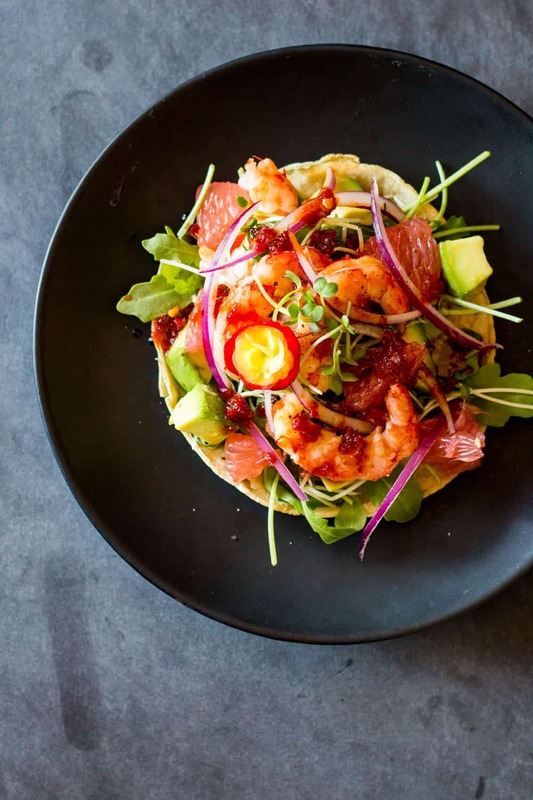 Absolutely everything is in these Shrimp Tostadas. Freshness, coolness, warmness, juiciness, sweetness, sourness, spiciness, crunchiness, softness. Did I forget something? I found the easiest and quickest way to make several tostadas at a time is to brush them with some flavorless oil on both sides. Lay them out on a large baking sheet. Turn on the broiler and toast for about 3 minutes, then turn and toast for a couple more minutes until they are your desired color and consistency. I like mine crispy but not burned. The original way to make them is on a “comal”. I don’t have a comal though and I doubt many people outside of Mexico own one. Besides, you can usually only make one tostada at the time. In the oven you can make several and serve everyone their food at the same time. It’s super simple. Put all ingredients in a high power blender and blend until all chilli is processed into itty bitty small pieces. Pour everything into a pan and bring to the boil, reduce heat to medium low and let cook for 10-15 minutes. Stir often to avoid anything burning to the bottom. The sauce is ready when the liquid reduced to about half. Remove from heat and let cool. The sauce will thicken as it cools. Sweet-and-sour red chilli sauce always goes well with shrimps and this one turned out extraordinarily delicious. Most store-bought sweet-and-sour sauces contain a scary amount of refined sugar. This sweet-and-sour red chilli sauce contains only 1/3 of a cup of coconut sugar. The best way is to prepare the sweet-and-sour sauce first and while it cooks, peel and chop the grapefruit and avocado. Then brush the tostadas with oil. While the tostadas are in the oven, preheat a cast-iron pan. When tostadas are out of the oven, add shrimps to hot pan and cook for about 2-3 minutes per side until fire red. Then it’s time to assemble everything. To show the steps I’ve created a short gif. Enjoy! If you love shrimps as much as I do, you will also enjoy this Mexican-Style Shrimp Capellini Pasta. Do you want more shrimp recipes? Wash red chilli and cut of stem. Add chilli, vinegar, water, coconut sugar, tomato paste, garlic and salt into a high-speed blender and blend until the chilli is processed into very very small pieces. Pour into a pan and bring to the boil over high heat. Once boiling, reduce heat to medium-low and let cook for about 10 minutes until about 1/2 the liquid evaporated. Stir every once in a while. In the meantime, peel and destone avocado and cube into 1/2" pieces. Peel grapefruit out of peel AND SKIN (!) and break into 1/2" pieces. Peel and thinly slice red onion. Set aside. Brush tortillas with flavorless oil on both sides (I used avocado oil). You can also use your fingers. Make sure to cover the whole surface, also the edges. Place tortillas on a non-stick baking sheet and turn on the broiler on high. Toast for about 3 minutes on one side and another 3 minutes on the other. In the meantime, preheat a skillet over medium heat. Remove sweet-and-sour red chilli sauce from heat and let cool a little. Take out tostadas from oven and set aside. Once skillet is hot, add a tiny splash of flavorless oil and shrimps (preferably in their shell), salt, pepper and cook for 2-3 minutes on one side and then 2-3 minutes on the other. Don't crowd the pan. If the pan is small, cook the shrimp in 2-4 batches. Making sure they don't touch each other. 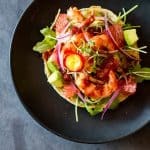 Now build the tostadas by adding arugula, cubed avocado, grapefruit, shrimps and red onion, drizzle with sweet-and-sour red chilli sauce and top with microgreens for decoration.